Quick-service counter serving iconic burgers and “famous” hot dogs. It’s worth noting that the Krusty Burger facade you see from the exterior of the building is just that, a facade. 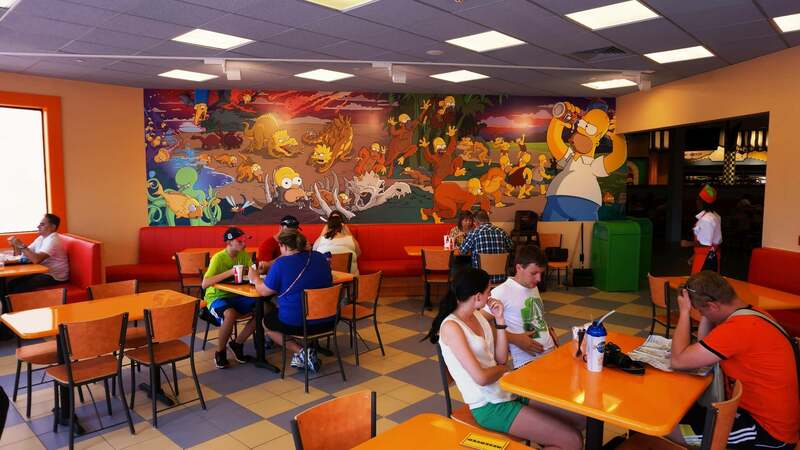 Inside what appears to be Krusty’s is actually just seating — Krusty sells food from a counter just like the other Fast Food Blvd options. Krusty Burger at The Simpsons Fast Food Blvd. Entrees are $7.99 to $12.99. Krusty Burger is a long running satire of popular fast food chains Burger King and McDonald’s. The Krusty Ribwich was created for The Simpsons TV series as a parody of the McDonald’s McRib and the ensuing guest reaction when McDonald’s took it off their menu. 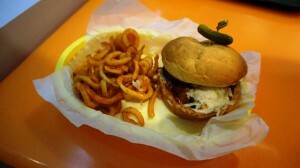 During our last visit, we ordered the Mother Nature Burger and curly fries. As noted, this burger is topped with guacamole and tomatoes. 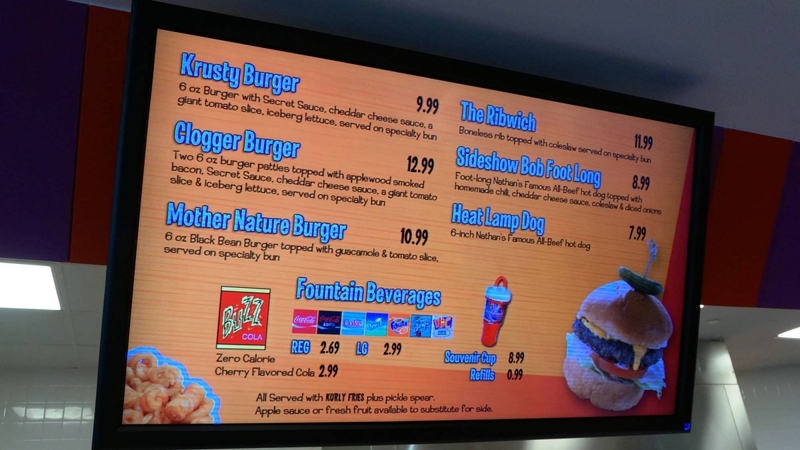 Sometimes it is difficult to find vegetarian options within the parks and while Krusty Burger still serves one of the few generic veggie options (pasta, pizza, veggie burger), they've done it well. The burger was crispy! Thank goodness for Krusty Burger for cooking this veggie burger well bringing out the flavor and enhancing the texture. The guacamole is spicy but very good. The addition of curly fries is also one of my favorites as you can't get these elsewhere in the parks. They are slightly spicy, crispy, and delicious. 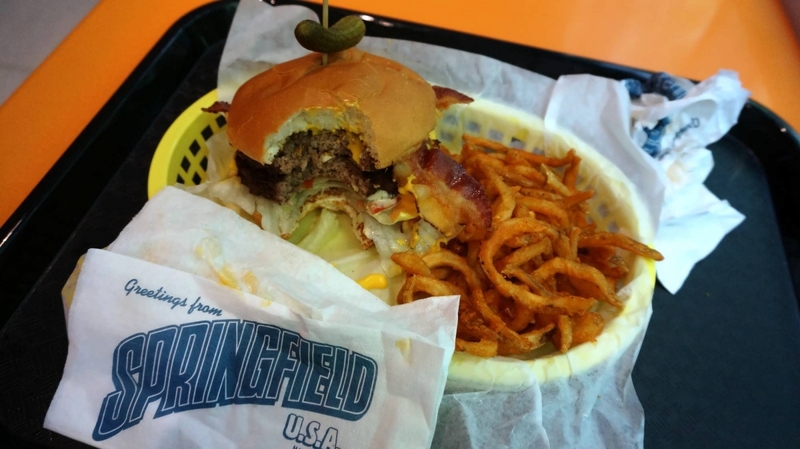 For a quick service restaurant, Krusty Burger was one of our favorites. Don't forget to wear your celebration pins as the staff will give you a free cupcake! Try the PBJ, it is delicious! Kudos also to the whimsical atmosphere! 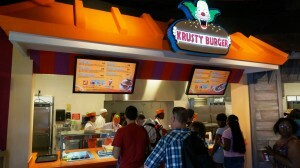 On our last trip to USF, we couldn't wait to try out Krusty Burger since we love the Simpsons ride so much. When we got there and go through the line, the crew working the line were very nice and friendly, but I wasn't so excited about the pre-cooked burgers or the pre cooked bacon. 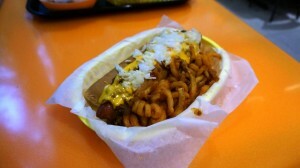 The Sideshow Bob Foot Long dog however, was amazing. You can't go theme " parking" without a hot dog and this is the one to get. They pile on chili, cheese sauce and coleslaw. I don't do onions, but you can have that too. The curly fries put it over the top and not necessary. As with a lot of the meals, you could easily split this with someone if you want to. Had the Krusty Burger with curly fries and a Flaming Moe. 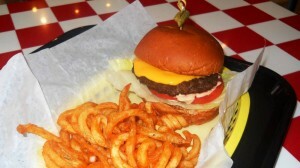 This burger is one of the best that I have ever had! The secret sauce really makes it great, and the curly fries were awesome! The Flaming Moe, though, was a little too expensive for what you get. After all, they need to fund the liquid dry ice somehow. 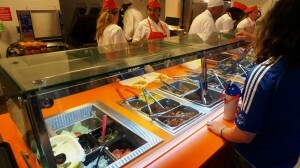 All in all, the best meal I had throughout the entire trip! 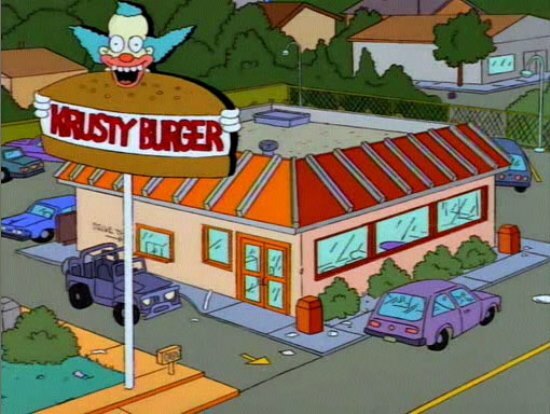 Krusty burger was the worst. The meat was horrible texture, no flavor, the condiments didn't make it any better. For the price that I paid for my family, we could of had a nice steak, each. Unexceptable. My United States Navy serves better burgers than this. I felt so bad that I had to make my kids eat at least half of it, so we wouldn't be hungry the rest of the day in the park. Also the staff didn't look very happy, because the customers want to order and eat, but have to wait a long period of time in a side line for the staff to tell us that we can proceed to the food station of our choice. I felt like a hurd of cattle. 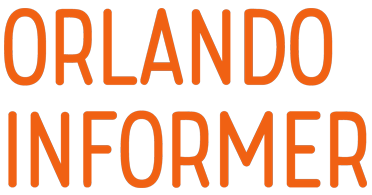 The organization needs to be revamped. And I find it hard to believe these other reviews below are really truthful. 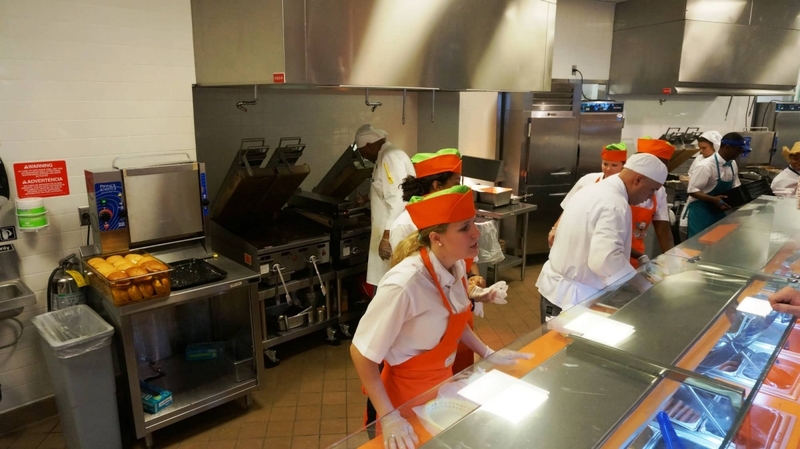 By the way, I was a cook in the U.S. Navy, and I know that there are better ways to serve 1500 meals a day! 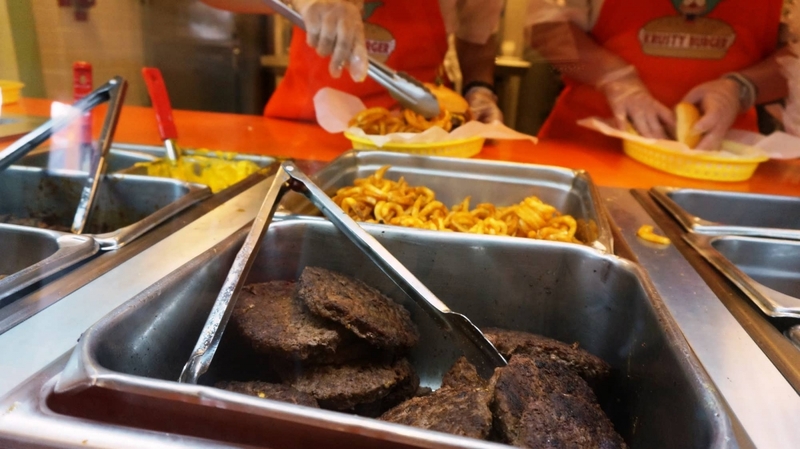 On my visit to Fast Food Boulevard and my trip to the States in general, I was on a mission to try different foods we don't eat here in the UK. I first had the different 'Chicken & Waffles', so thought I would also try a Ribwich. Since here in the UK I cannot remember the McRib being available at McDonald's (maybe it never was? ), I fancied a rib sandwich. 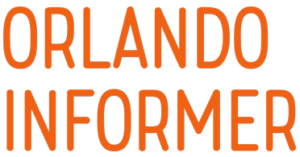 It was really really nice, and it confirmed my opinion that the Fast Food Boulevard is the best Quick Service area at USF!